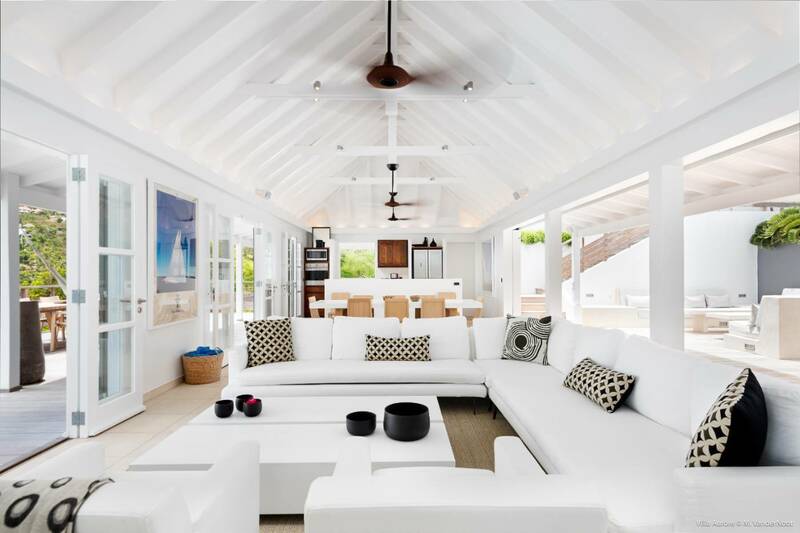 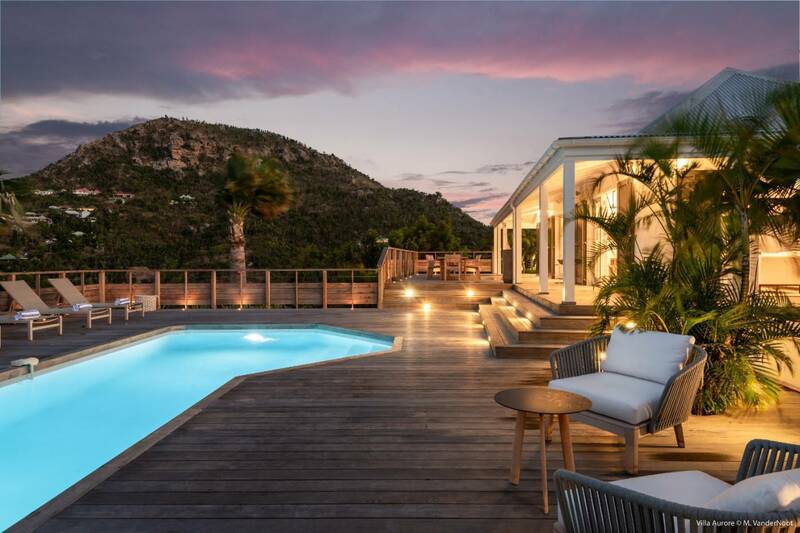 Dream About: A hillside retreat with a sea view and a heated swimming pool – and sharing it with your best friends. 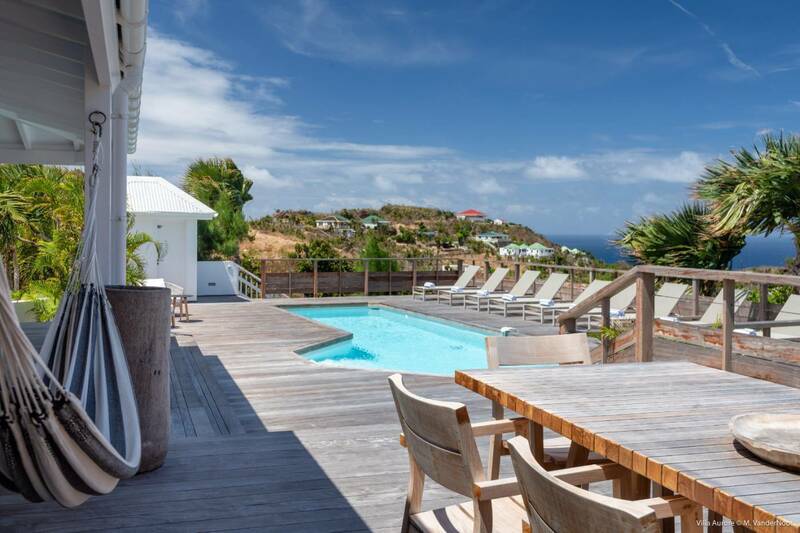 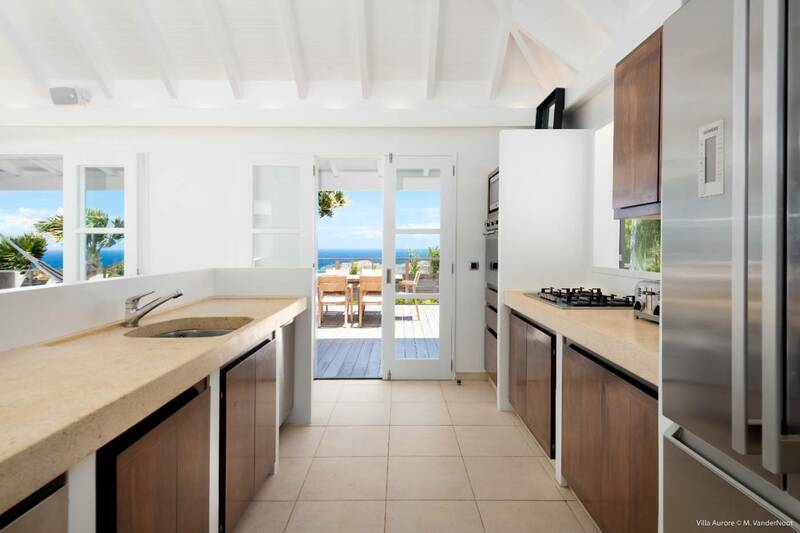 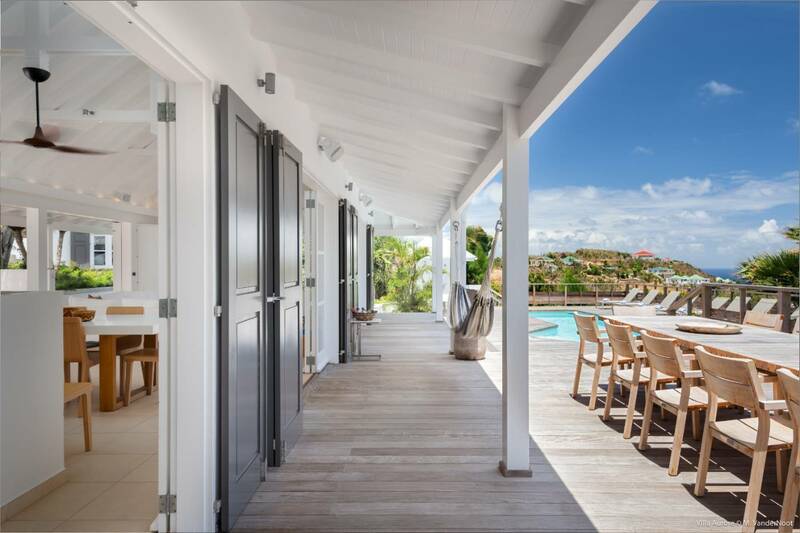 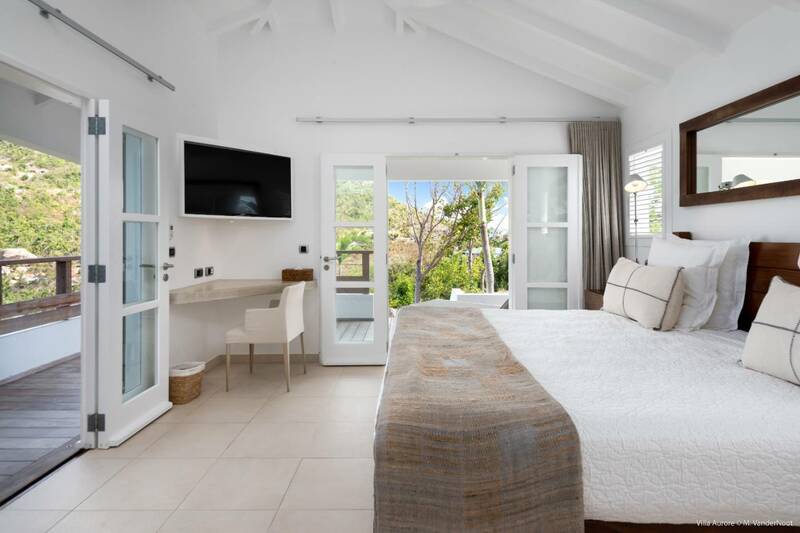 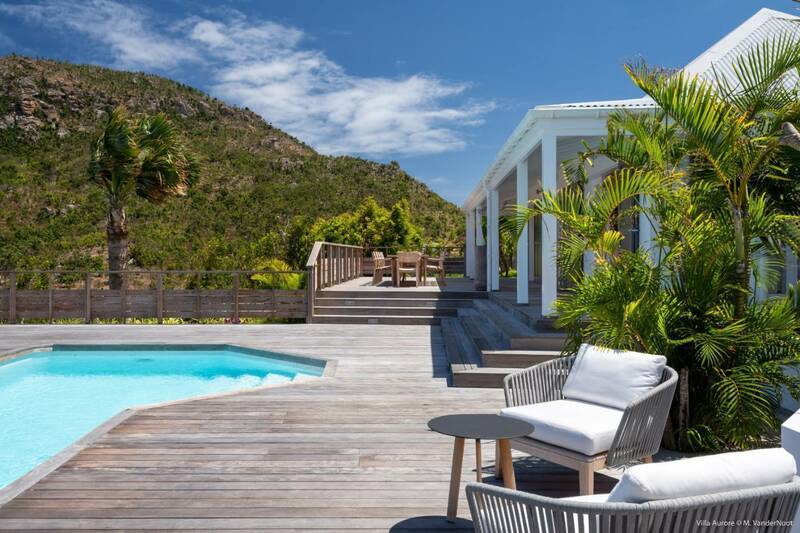 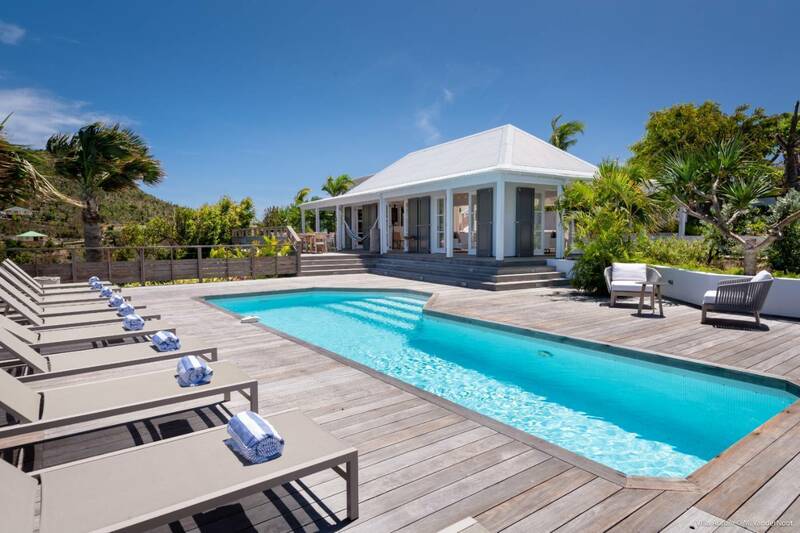 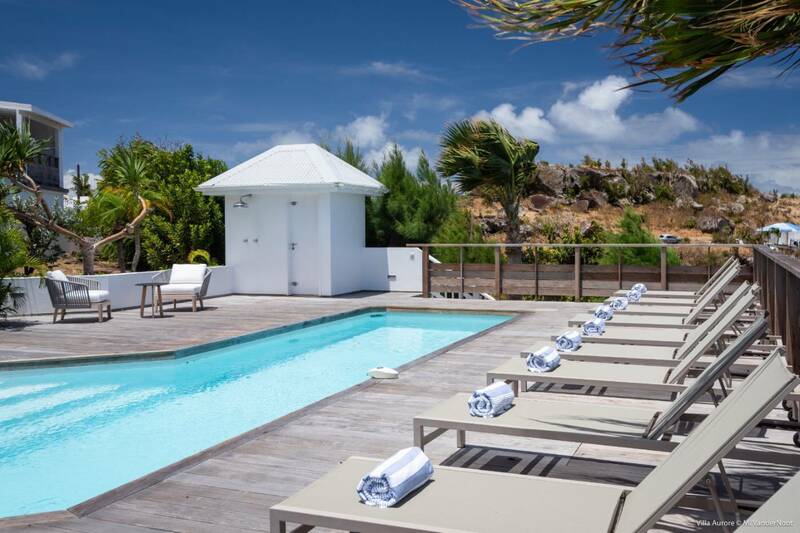 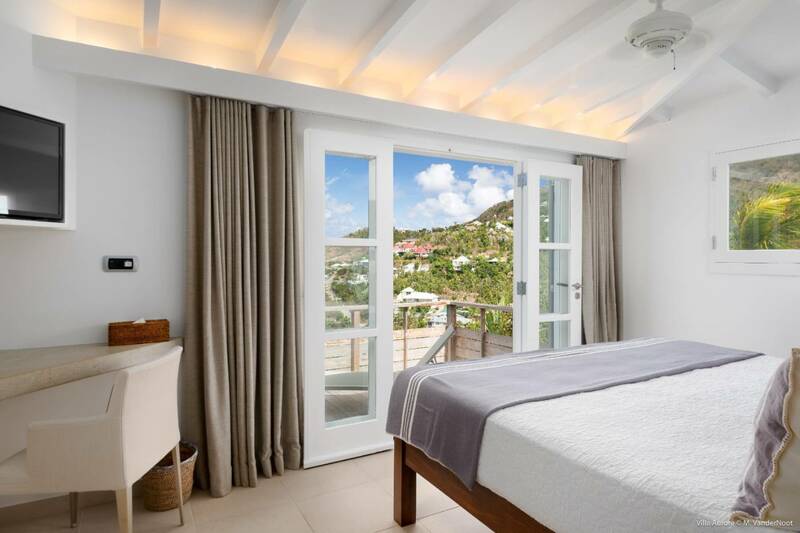 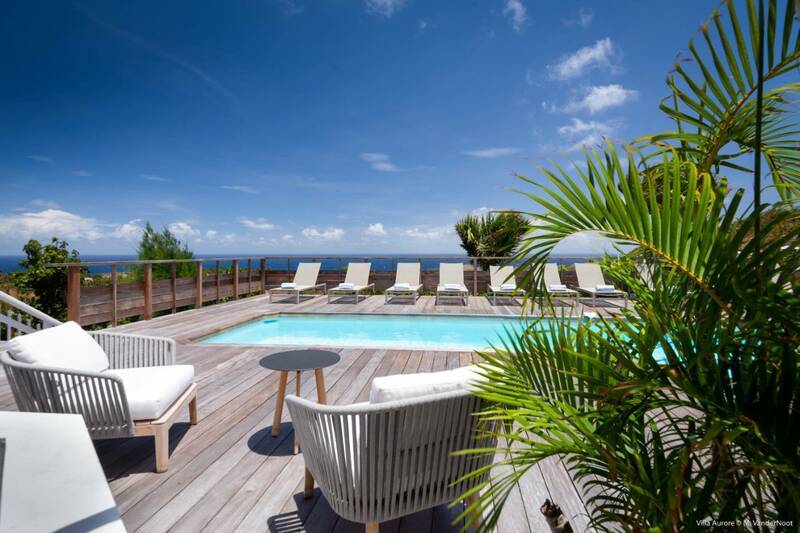 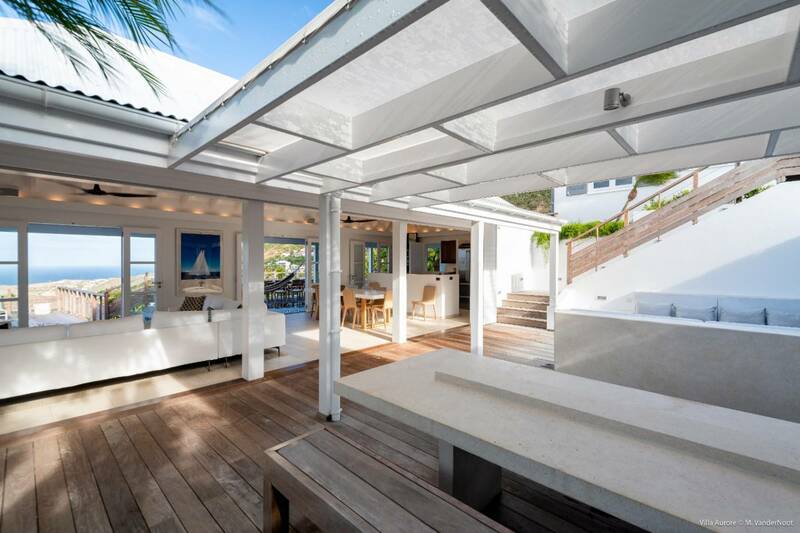 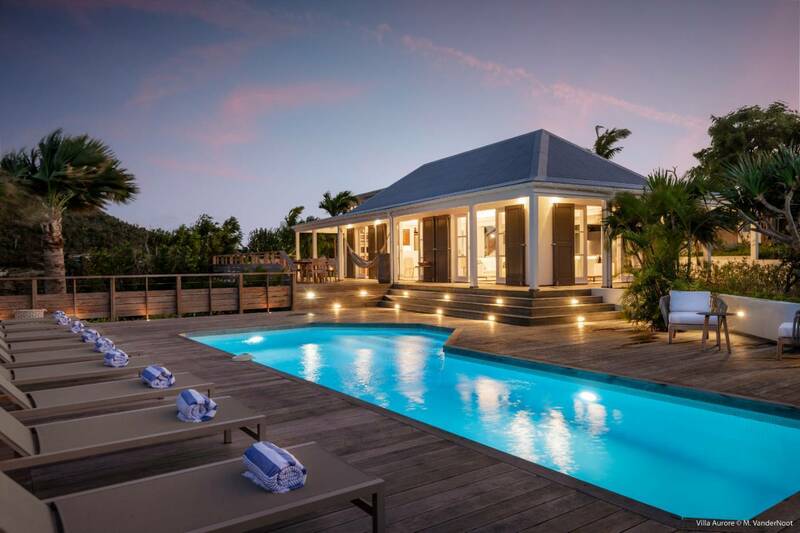 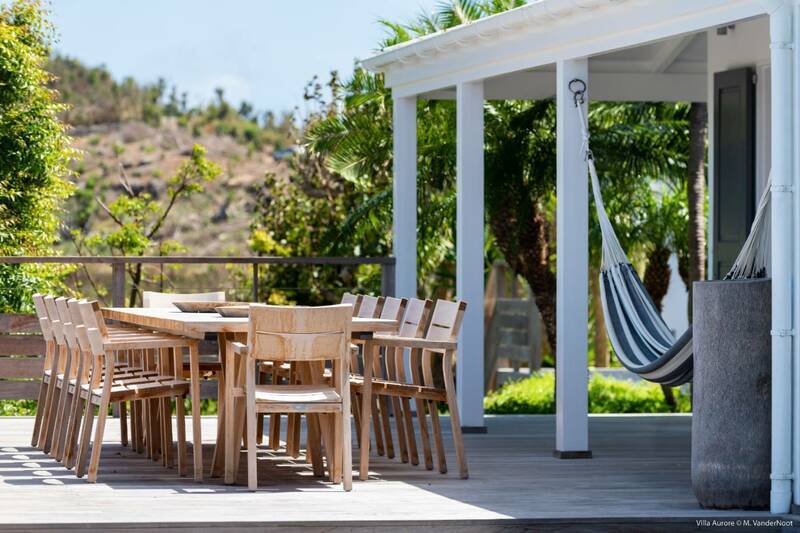 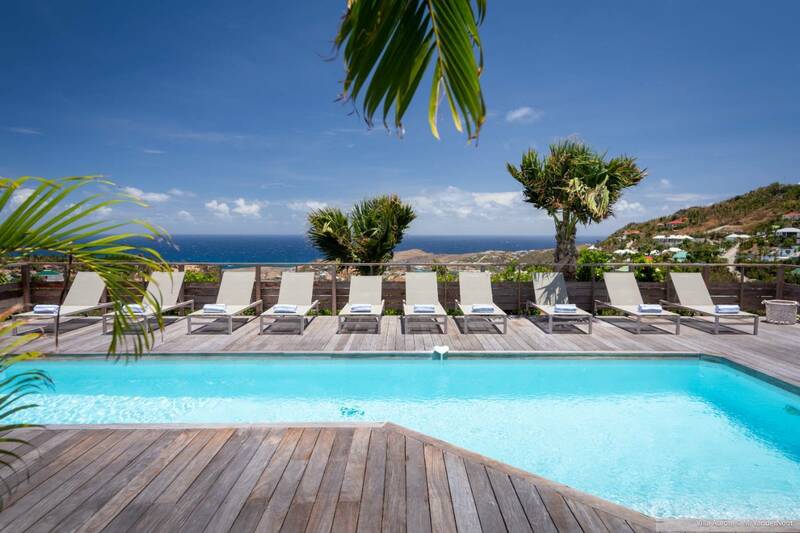 Privately situated on the hillside and boasting a lovely sea view, Villa Aurore provides the perfect haven for a group of friends or an extended family as it offers five bedrooms and five and a half bathrooms. 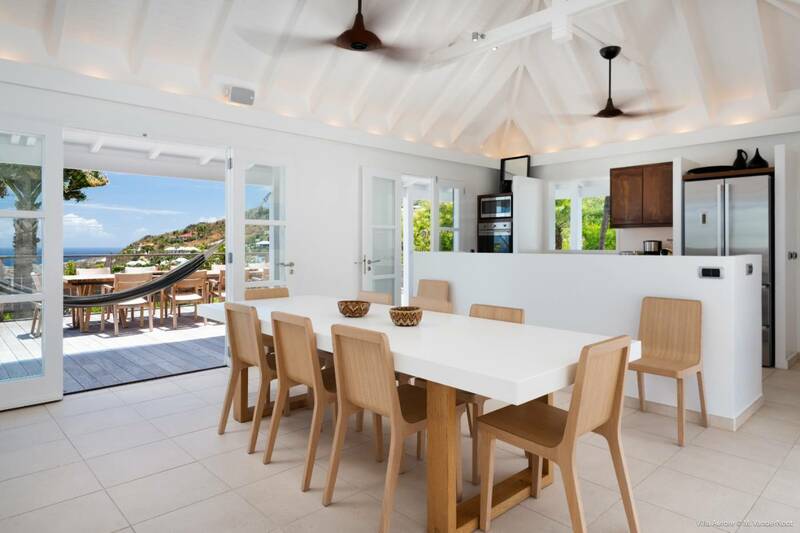 The main building has an indoor living area, dining area and fully equipped kitchen. 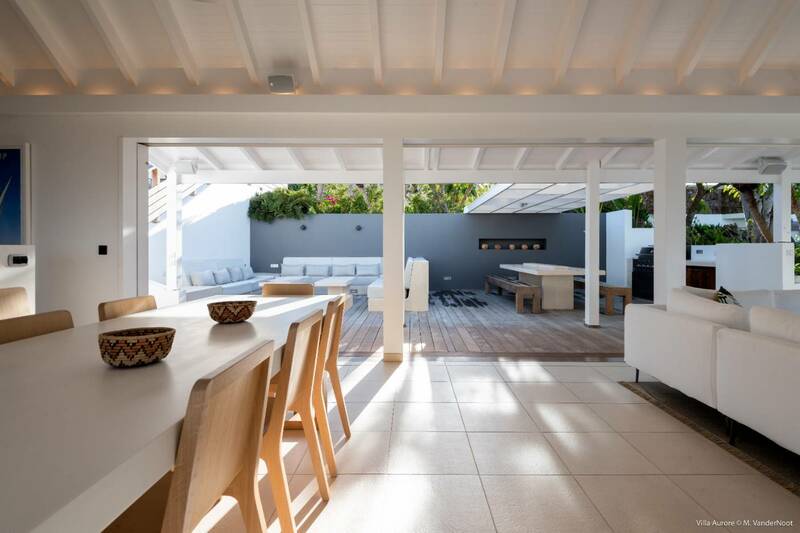 An outdoor dining area includes a gas grill, and located behind it is an additional built-in sitting area. 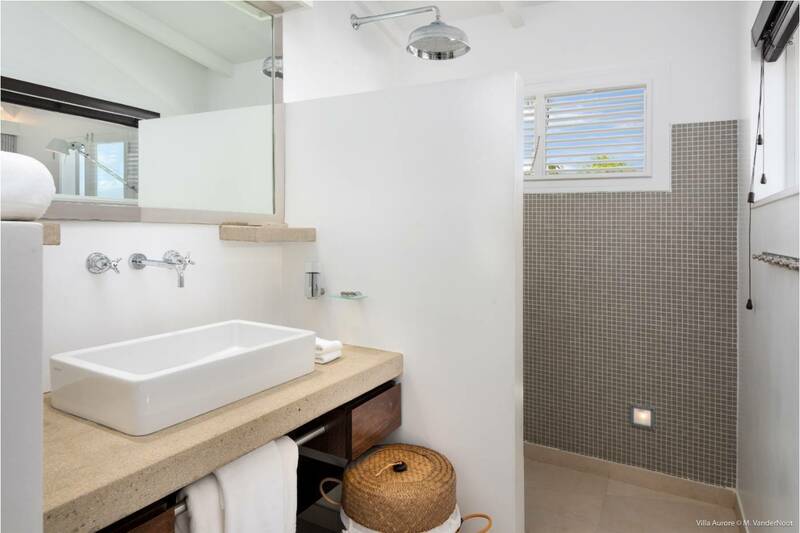 The front doors open onto the very large deck, the inviting heated swimming pool and the guest bath. 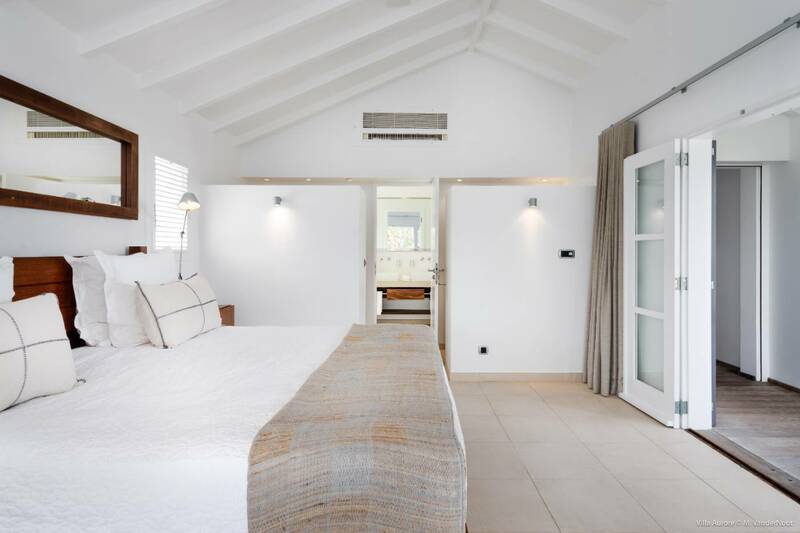 Four of the bedrooms can be accessed from both the parking area and the rear terrace. 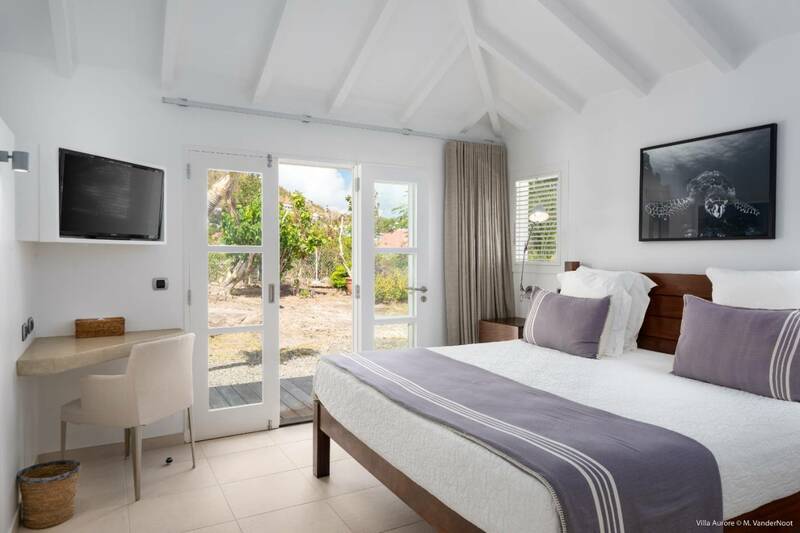 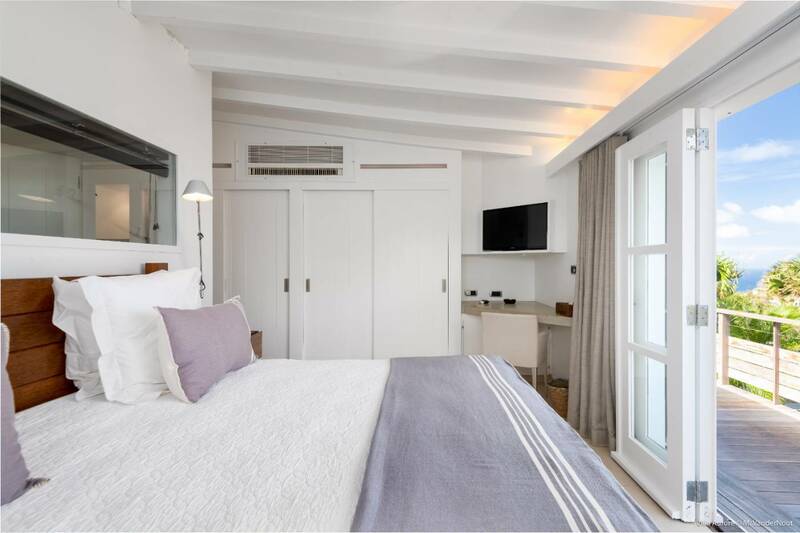 Two king bedrooms with en suite baths and sea views are located on the left side of the corridor while two more en suite king bedrooms are on the right; one has a sea view and the other looks out to the beautiful gardens. 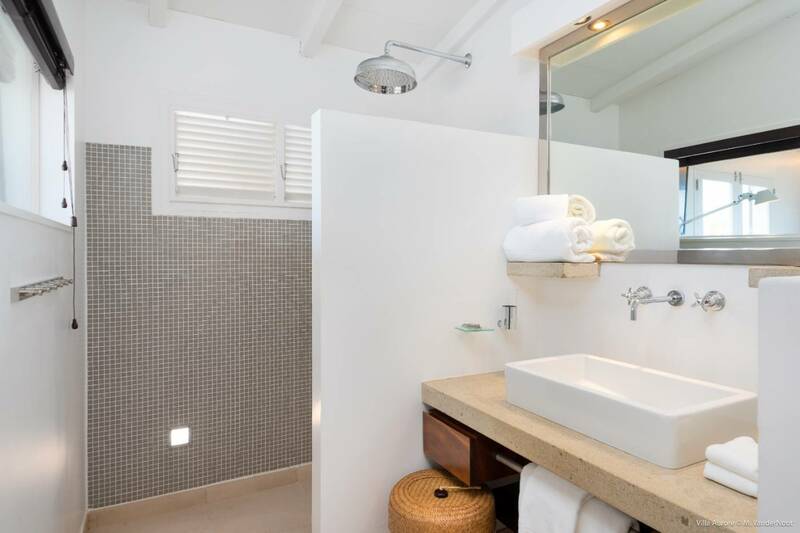 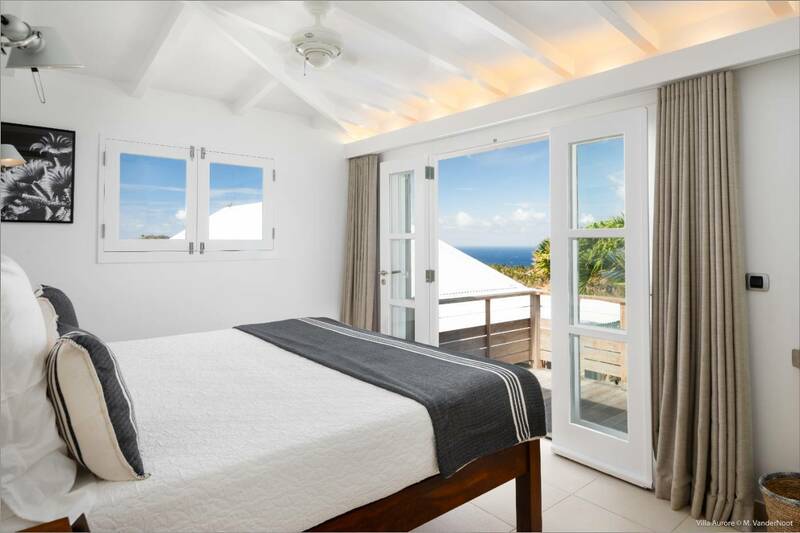 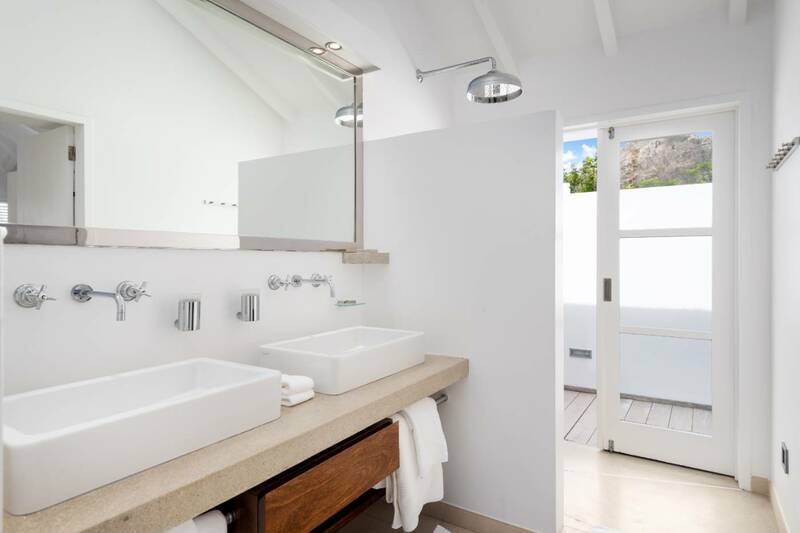 Another king bedroom with en suite bath is located off the parking area and offers a private deck and ocean view. 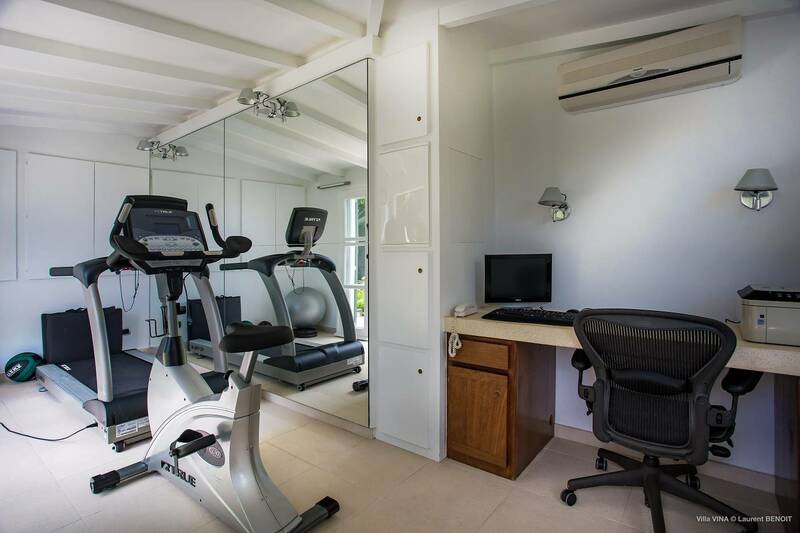 A separate air-conditioned bungalow features an office with a computer, printer, fax and gym area. 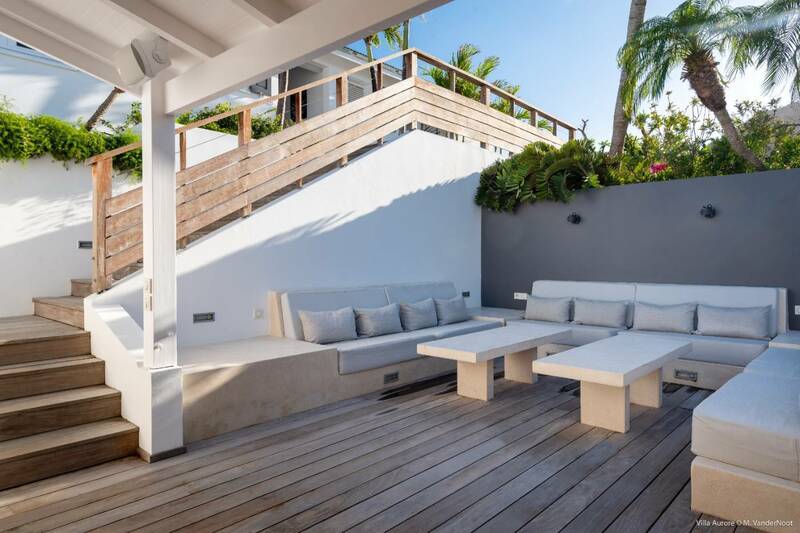 The outdoor "living room" with its custom banquettes. 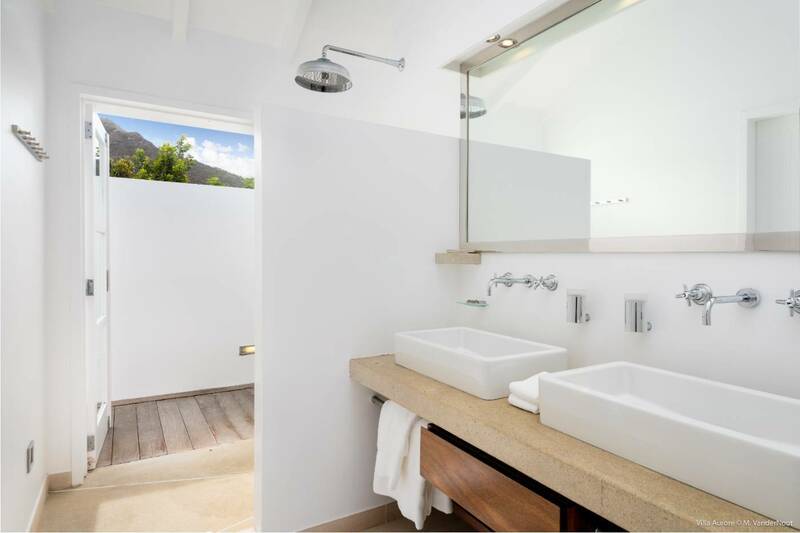 The 5 bedrooms all have baths en suite. 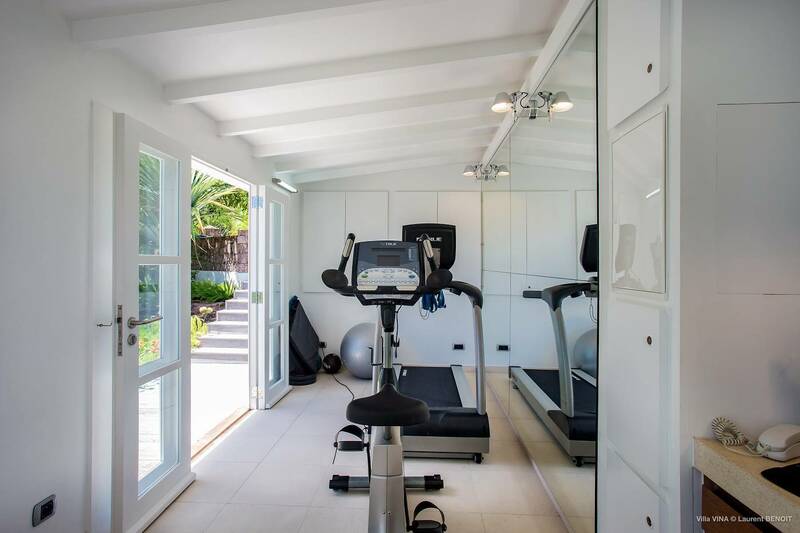 A separate bungalow does double duty as a fitness room and office.